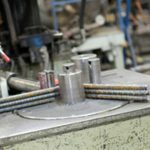 Rebar - DeVille Steel, Inc.
State of the art automated rebar bending equipment allows us to fabricate everything you will need for concrete reinforcement. 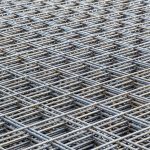 Once your rebar plans have been reviewed and approved, our team of fabrication specialists will get to work cutting, bending and shaping your project into existence. DeVille Steel accounts for every piece of rebar, every sheet of mesh and every accessory you’ll need on the job based on your plans and specifications. 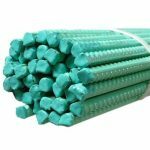 All of the rebar is then neatly bundled, tagged and delivered for easy retrieval by your team. We are local so site visits are not a problem. Many of our employees have experience working in the field, and know the tricks of the trade that make jobs run smoother. Our process is designed for rodbusters, so they can easily identify and assemble the pieces necessary for your project. DeVille Steel has designed every step of our process to save our customers time and money. Simply send us your drawings, step back, and let us handle it! We use cutting edge equipment which can make hundreds of different shapes including standees, ties and hairpins. Slab Bolsters provide proper reinforcement, ensuring accurate placement. 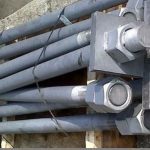 Galvanized, epoxy coated and weldable. From form savers to zaplocks, sometimes the job requires some jewelry for rebar professionals. 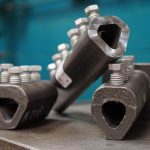 Our rebar team can manufacture any anchor bolt your job requires. We stock 8′ x 15′ welded wire mesh because it is easier to handle, saving you time and money. Other sizes can be special ordered.